In addition to reviews of the CDs of Salsa Mayor, this section includes a review of Maykel Blanco's releases with Envidia under the name Maykel Blanco y Suprema Ley. 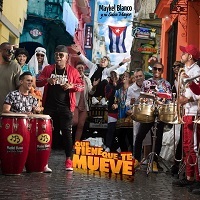 "Que Tiene Que Te Mueve" is the first full album by Maykel Blanco y su Salsa Mayor to be released on Maykel's own record label, MB Record. It has been nearly four years since their last studio album and we have been rewarded for our wait with twelve superb tracks. Of course Maykel knows that you're only as good as your last hit, so during that time Salsa Mayor released "El Chaca Chaca" in 2017 and "Ya Se Acabó" in 2018, both as singles and video clips, as well as the 2018 live album/video "Somos Mayores" filmed during their 12th anniversary concert, which featured the Cuban National Symphony Orquestra. The lead singers are now Yordys, Kasanova and Aggayú (Altides Landa) and the album version of "El Chaca Chaca" has been re-recorded with Aggayú on lead vocals. However, "Que Tiene Que Te Mueve" also includes collaborations with the great Mayito Rivera on "Yo Comprendo", and a guaguancó-timba version of Yoruba Andabo's "La Cafetera". This album is quintessential Salsa Mayor with their signature sound and timbalovers dance arrangements. It has also been masterfully produced and the pacing of the album is brilliant. Stay tuned for the full review. 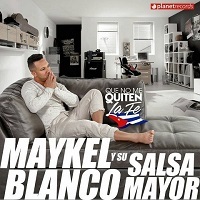 "Que no me quiten la fe" has been kept under wraps more than any previous album by Maykel Blanco y su Salsa Mayor. Prior to the release we had already heard the radio demos of "Te Escapaste", "Mi Mulata En La Habana" and "El Negocio", as well as bits and peices of songs such as the title track and "Afloja La Guayaba" from the videos Maykel uploaded from studio recording sessions. The album was released on December 18th at digital retailers - just in time for Christmas! The band had some personnel changes between the radio demos and the release of the studio album. Alexis David went to La Charanga Habanera and Kasanova and El Chino from Azúcar Negra joined Salsa Mayor. You can read more about this in the full length review coming soon. Maykel Blanco's fourth studio release has been his greatest success so far, selling a record number of units in the first few months. With "A toda máquina" Maykel proves that he is no longer the new kid on the block struggling to make a name for himself. He has managed to claim his own space in the toughly contested world of dance music in Cuba. And surprisingly he's managed to do it on his own terms without resorting to reggaeton guest singers to reach the younger dance crowd. "A toda máquina" means "at full speed" and Maykel could not have picked a more apt name for this latest production. Click here for a full review. Maykel Blanco y Salsa Mayor are back with another hot timba album. Maykel is a prolific composer and the band has been churning out one CD every other year to their fans' delight. Maykel consistently composes solid, catchy lyrics and combines them with irresistible dancefloor-ready arrangements that make Maykel’s songs favorites among DJs and dancers. “Soy lo que te hala” returns somewhat to the sello of their mega-success debut album “Recoge y vete”. This may in part be due to the return of singer Yordi Larrazabal. There are just certain combinations of musicians that seem to have something special that makes them more than the sum of their parts. Maykel and Yordi are an example of this. Yordi sings lead on four of the ten songs on the album, and when you hear them you know that you are listening to Maykel Blanco y Salsa Mayor. Pavel “La Figura” Delgado and Yasser Ramos round out the front line, which is one of the most charismatic in Havana today. Click here for the full review. Recorded sometime in November/December 2006, this CD came about by chance. Maykel told us in an interview that the recording was not originally intended for sale, but when they heard it they thought, "Hey, this sounds pretty good, maybe we should do something with it". So it was sold to Envidia who have now released it with their Cuban Roots collection. Click here to read the full review. Maykel Blanco y Su Salsa Mayor are all about making you dance and their début album proves that they mean business. The first line of the opening song sums it up: "Ven, que quiero darte lo mejor de mí y conquistar toda tu alma. Que cantes, que bailes, que goces conmigo hasta mañana". Recoge y vete is packed with hits from start to finish, and it is a dancer's dream. Of the eleven songs on the CD, ten will fill the dance floor. Only the last song on the CD, which is timba romantica, is unlikely to throw dancers into a frenzy. Click here for the full album review . Si quieres, quiéreme was a promo that reached Europe before the CD Recoge y vete was completed. Most of the songs are the same, although the order is different and the versions on Si quieres, quiéreme are less developed then what later appeared on the actual release. The demo also contained 3 songs that didn't make it onto the final album and these are what we look at in the full review . Ya llegaron los cubanos is Maykel Blanco's first release and was recorded with his previous group, Suprema Ley. All of the compositions and arrangements are by Maykel and it is hard to find fault with the CD. Click here to read the full review.